It's all about the cars…..born from my lifelong and incurable obsession with cars, MTSV aims to service the requirements of those fed up and bored with their usual everyday over complicated, characterless "Euro box" saloon or hatchback, which is hemorrhaging cash, and who are looking for a quality modern classic vehicle at a real world price, with no hidden or worthless extras. To ensure the quality and pedigree of the cars I sell, I personally source each and every vehicle myself, and travel the length and width of the country in order to find the best examples possible. I avoid buying cars at auction and endeavour to source vehicles from careful, sympathetic owners. Needless to say, all my cars are fully HPI checked, and I refuse point blank to sell anything that I wouldn't use personally. I've also always maintained, you simply can't be a volume seller of classic cars, and still do "the job" correctly; these cars require a special level of attention to detail, something a volume seller wouldn't be able to sufficiently give. Besides, I'm not interested in moving "metal", I'll leave that to the big boys who seem to be more interested in selling finance than cars; what I offer is carefully selected vehicles for those discerning buyers looking for something a little different. If you want to buy a car from a fancy state of the art show room, staffed by commission hungry, suit-clad salesmen, who probably know much more about their extortionate finance deals, than about the cars they're selling, then look elsewhere, as that's not the way I work! Because of the very specialist nature of the cars I sell, I try to keep operational costs as low as possible, to be able to pass that saving onto the customer. 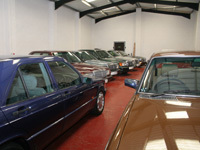 I operate from a modern industrial unit, where all cars can be viewed in a dry indoor and well lit environment, it also doubles up as my workshop. 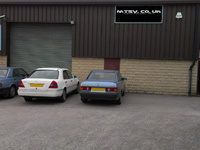 Naturally, to be able to offer each customer the best service, viewing is still conducted on a "by appointment" basis. I still, and will always remain a true car enthusiast and I'm committed to providing a reliable, honest and friendly service in a relaxed environment, and strongly believe in letting the cars sell themselves. You won't find any high pressure sales tactics here--I don't like it, so wouldn't subject anyone else to it - I'll let you make up your own mind about the car(s) you're viewing, and if you want to go away and think about it that's fine too!. Even into my twelfth year of doing this as my full time occupation, I still feel its like having a paid hobby, so I tend to do things somewhat differently to traditional motor dealers. As such, I'm very, very keen to shake off that pre conceived image everybody seems to have of a motor dealer - there's NO high pressure selling, NO silly rate finance deals and NO worthless warranties and definitely no sheepskin overcoats or trilby either; I try my utmost to get things right from the very beginning. To find out more about the way I work, and my terms of sale, click here. Most dealers these days seem to buy a car, have it valeted, and sell it. This "commodity type" approach to cars is somewhat understandably encouraged by the way VAT scheme for used vehicles works under what is called the margin scheme, and a scheme most VAT registered (bona-fida) dealers have to use. Basically the costs of any work carried out and/or replacement parts fitted, cannot be added to the initial cost of the vehicle, with the VAT element being payable on the perceived entire profit made between the original purchase price and the selling price. It, therefore doesn't take a mathematical genius to deduce you could actually in reality easily loose money on a vehicle once the VAT is paid. Obviously this encourages the profit obsessed dealers out there to do as little as possible, as cheaply as possible.....not a good recipe, you'll agree! On the other hand, even though I'm faced with the same constraints, and it would be so much easier to follow the crowd and sell the cars "as is" with a "margin" plonked on the purchase price, I just can't do that as I like cars too much, and its very satisfying for me to know when a car leaves me, its as good as I can get it. As such, when I buy a car, I like to drive it as much as possible to for a while to get to know it better, and in the process sort out as many niggles and problems as I can myself. I don't use valeting companies either, as I don't agree with some of their methods they sometimes use. 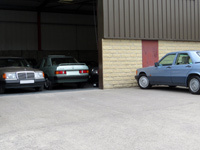 For the jobs I can't do, or for those that have safety implications I use either a trusted local garage, who have over 30 years experience, and a local paint and body shop who have many years experience working with older and classic cars. Finally, when the vehicle is as right as I can get it, I sell it. In some cases this can be up to a year (or more) later! I don't see my cars as merely "profit opportunities" or commodities, but as individual machines, which will ultimately represent what I do, and carry my reputation with them. Well I'm told I'm a straight forward, reasonably well educated and honest family man, and proud Yorkshire man too, who's loved cars since as long as I can remember. I have two sons (11 and 15 years), both of whom I hope become fellow "Petrol heads", and follow in my footsteps. According to my parents, from about the age of two, I could name just about every car on the road, and some forty odd years on, I count myself very lucky to have built a successful business around my interest, shortly after being made redundant, from almost twenty years in the bicycle industry; cycling is my other love by the way……..and they said cars and bicycles don't mix! If I had a big win on the Lottery tomorrow, I admit I'd shut up shop, and have a massive heated "car house" built, and keep all the cars I've got at that point in time for myself! This website is unlike those used by many other motor dealers, who seem just to use standard issue templates. This is all my own work, developed over several years and has not been designed or maintained by any other person than me. It may not have been designed by some hot-shot web site design company, or by some long haired marketing guru type, but I've been told on many occasions it's very informative and functional, and has real content...which I suppose is the whole point of a website. Also just to mention, 99.99% of the decorative images used on this site are NOT library images, but are ALL my own photographic work, and are images of actual cars I've owned and supplied in the past. Lastly just to reassure all potential customers, I'm a fully VAT registered, DVLA registered motor trader, and wholly committed to providing a high quality, honest & friendly service. I'll be here today, tomorrow and the day after that, and will continue to be as long as this remains financially viable, or I have a very big win on the lottery! If you have any queries, or just want to chat about cars, please contact me. Either click here to e-mail me, or call me on 07976 280738. I love to talk about cars, am happy to share my exprience with fellow enthusiasts and will be as helpful as I possibly can when asked for any additional information and/or images on any vehicles I have for sale. Also, in these uncertain economic times of record low interest rates, buying a classic car can make good financial sense. Click here to find out why.